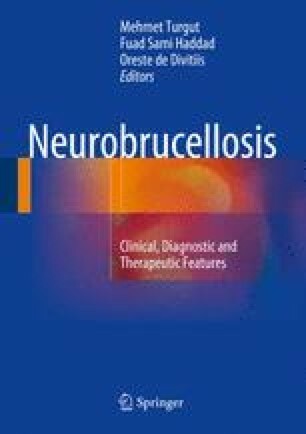 Brucella polyradiculopathy is a rare manifestation of neurobrucellosis. Polyradiculopathy usually gradually progress and cause numbness and muscle weakness in extremities. Patients may present with pain, sensory abnormality, weakness of the extremities, and gate abnormality. Neurobrucellosis is diagnosed according to signs and symptoms, using laboratory tests including serology and imaging. Magnetic resonance imaging with gadolinium injection usually shows enhancement of lumbar nerve roots in Brucella polyradiculopathy. For confirmation of polyradiculopathy, nerve conduction studies and electromyography examination are used. Treatment of Brucella polyradiculopathy is not different from that of neurobrucellosis. The most common medications used for the treatment are rifampicin, trimethoprim-sulfamethoxazole, doxycycline, ceftriaxone, ciprofloxacin, and streptomycin. Clinical features of the patients guide the physician for duration of treatment. Prompt diagnosis without delay in treatment is associated with fewer sequelae and excellent prognosis.